Aotearoa with Paua Design Black Spaghetti Tank The lettering as well as the bar in this design is done in a Paua design pattern. Paua are found all around the coastal waters of Aotearoa, New Zealand. The further south the paua are, the colder the water is and the colours are darker. Aotearoa with Paua Design Dark Spaghetti Tank The lettering as well as the bar in this design is done in a Paua design pattern. Paua are found all around the coastal waters of Aotearoa, New Zealand. The further south the paua are, the colder the water is and the colours are darker. Matariki Names Black Spaghetti Tank The rising of the star cluster Matariki in June heralds in the start of the Maori New Year. The star cluster Matariki is also known as Pleiades, Seven Sisters and Subaru. Aotearoa Lizard A Girls shirt with a design incorporating a lizard design from New Zealand. Our spaghetti tank from American Apparel will keep you in style year round. 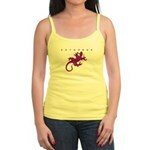 Made of soft 100% superfine combed cotton baby rib, this tank provides the perfect silhouette.